Visiting the worst-hit places in Chengannur, the Express team was approached by many elderly people, especially women. CHENGANNUR: “Child! Do you have water in your car? Or can you spare me some money? If not money, maybe some clothes or food? Don’t you have anything in your car?” asks 65-year-old Ponnamma, a spinster who lives alone in her crumbling house. This was not an isolated incident. Visiting the worst-hit places in Chengannur, the Express team was approached by many elderly people, especially women. Despair and dejection were writ large on their faces, unsure of where to and how to restart their lives. 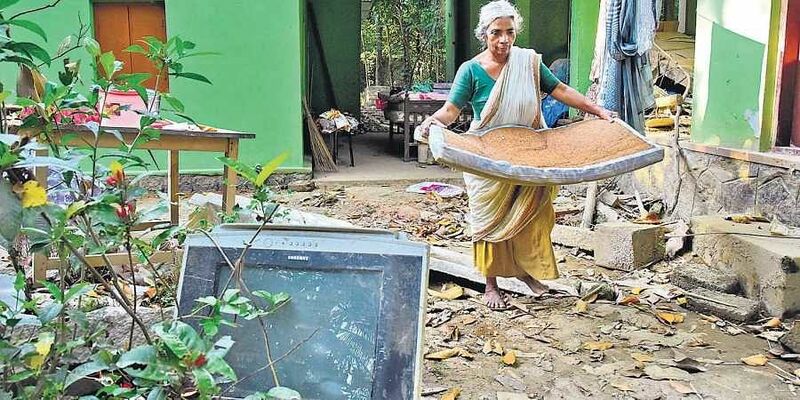 “Many of these people don’t even know the government has begun distributing the compensation amount of Rs 10,000,” said Sarasamma, a resident of Edanad. However, Ponnamma was sceptical. “Can you tell me as to how much the amount can buy? Try getting a mattress or two and some household goods with it,” she scoffed. Her neighbour Vani was of the same opinion. “Do you know how much we had to spend to get our houses cleaned? A single labourer charges `800 per day. Houses need multiple cleaning and it takes around two to three weeks at least to make the building habitable. Besides, a coat of paint, cleaning of the surroundings... everything requires money. For those who can afford it, it’s a cakewalk. But for people like Ponnamma who earn their bread and butter by doing odd jobs, it is a tough task,” she said. The floods have washed away the means of livelihood of many people. “People have locked up their houses and gone off. Cleaning and repair works are going on, so they don’t need household servants now. It will be a long month or two of unemployment and financial struggle,” said Vani. She said the authorities should ensure these elderly people living alone are notified of all the benefits announced by the government. “They have no means of learning about the schemes. They should also ensure the benefits actually reach them instead of undeserving people who may try to exploit them,” she said.